This golf tip showed up in my inbox this week. It is a good example of being careful where you get your golf advice from. The article is in black with my comments of where to be careful in Red. Mention this article and book an Indoor lesson in the evening on the 18th, 19th, or 20th of November and receive a $500 In FREE GAS Gift Certificate. Located at the Potentia Building 1100 East Paris. Call 616-802-4969. Written by I’ll save the author the embarrassmant of having his name tied to this critique. You hear this mantra in every sport – keep your eye on the ball! It’s a perfect chant for the golf player at every turn. If you can’t see the ball clearly, your chances of hitting it are slim to none! When you look at the ball, you want to keep your eyes on one spot. Don’t look at your club to see if it’s squared to the ball. Don’t let your eye follow the club as you draw it away Just focus on the ball – nothing else. How in the world do blind people play golf??? For the last time, you don’t have to see the ball to play good golf. Learning good impact is far more important than giving the ball a psycho killer stare. Also, when you look at the ball, try to get a bird’s eye view of it. Your eyes are about a foot above the pivotal center so raising your shoulders isn’t going to help you see the ball better. Does anyone have a clue what he is talking about? Don’t gaze at the ball along the line of the shaft of your club. Look down on the ball rather than get your angles along the shaft. This will give you much better results and you won’t have a tendency to look up too soon. I’ll give you a $100 if you can find me someone who looks up to soon. Nobody does, so stop worrying about it. It is not your tendency and it is not the tendency of any golfer who has ever lived. Now, there’s a natural tendency in everyone to look away when you start to draw the club back. Ignore that tendency and just keep looking down on top of the ball. When you’re looking down you’ll notice that (if you’re leaning over properly) the only way you can keep the club head in the line of flight What in the world is the line of flight? is to keep your hands moving along parallel with that line. 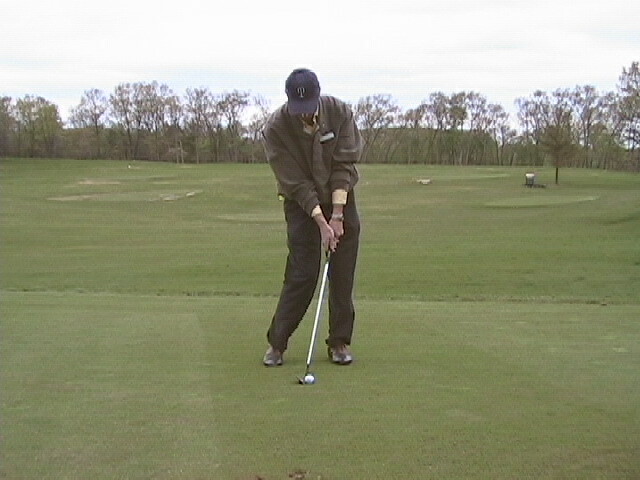 Sweep your hands along with the club head while the ball and head are in contact. Is this guy speaking English??? Mastering the skill of seeing the ball clearly until you hit it is true of every kind of shot. Whether the ball is in long grass, on an up or down slope, no matter what’s around you -the main thing is to see the ball clearly to hit it accurately. Great Sherlock, so the fact that I have lousy alignment, swing the club like an unfolded lawnchair, scoop it like icecream and couldn’t hit water if I fell out of a boat can all be cured if I see the ball clearly? Very few golfers stand still when looking at the ball and concentrate their attention on seeing the ball clearly. A lot of the times people will give a glance in the direction they want the ball to go, then they look back at the ball. 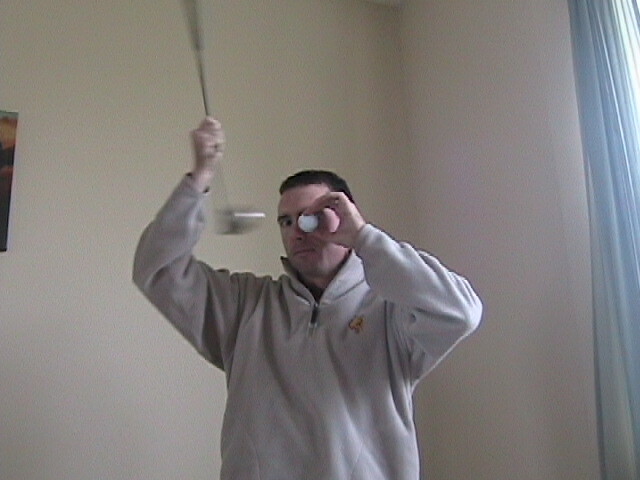 Many golfers would be shocked to find out that they don’t stand still and keep their eye on the ball. The second your gaze shifts from the ball during any part of the swing, problems occur. Problems occur and are magnified when you read articles like this. Really, a lack of concentration is responsible for most golfing mistakes. You can hit the ball well when you can clearly see the ball at every point in your swing from start to finish. I’ll just copy and paste what I said before. Where do these people get a liscense to write about golf? If you want to wipe out one of the worst golf faults, determine that from the top of your swing until you hit the ball you will keep your eye clearly on the ball. You’ll find your golf game improving so significantly – your friends may start asking you for lessons! I tried this guys advice and now I have a wealt on my forehead! !